In this lesson, we will learn how to use formulas to solve problems in real-life contexts. The circumference of a circle as a function of its radius is given by 𝐶 ( 𝑟 ) = 2 𝜋 𝑟 . Express the radius of a circle as a function of its circumference, denoting it by 𝑟 ( 𝐶 ) , and then find 𝑟 ( 3 6 𝜋 ) . Use the formula 𝐴 = 1 2 𝑏 ℎ to determine the height, ℎ , of a triangle given that its area, 𝐴 , is 4.5 and its base, 𝑏 , is 2. The circumference 𝐶 of a circle can be estimated using the formula 𝐶 = 4 4 7 𝑟 , where 𝑟 is the radius. Find an estimate of the radius of a circle with 𝐶 = 6 7 . 1 . Round your answer to the nearest tenth. The surface area, 𝐴 , of a sphere in terms of its radius, 𝑟 , is given by 𝐴 ( 𝑟 ) = 4 𝜋 𝑟 2 . Express 𝑟 as a function of 𝐴 and find, to the nearest tenth of an inch, the radius of a sphere whose surface area is 1000 square inches. The volume, , of a cylinder with radius and height is . Given that a cylinder has a height of 6 metres, write an equation for the radius of the cylinder as a function of , and then use this to find the radius of the cylinder if its volume is 300 cubic meters. Give your answer to two decimal places. The volume of a right circular cone with radius 𝑟 and height ℎ is 𝑉 = 1 3 𝜋 𝑟 ℎ 2 . First, write an equation for the radius of a cone with a height of 12 inches as a function of 𝑉 . 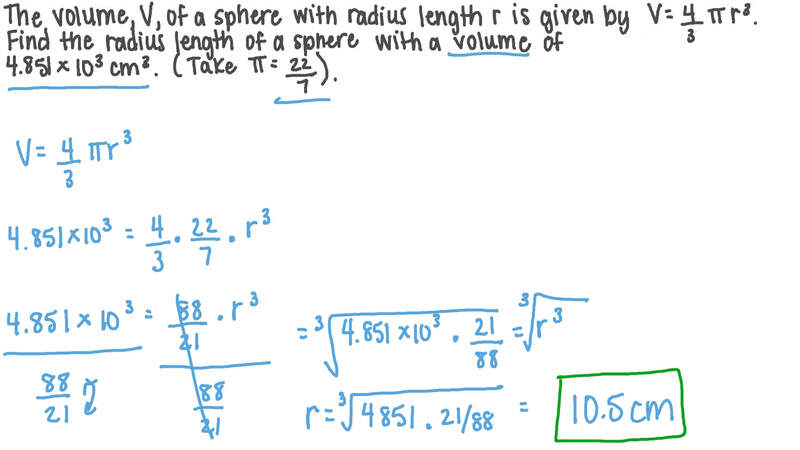 Then, use this to find the radius of the cone to the nearest whole number given that its volume is 50 cubic inches. A room’s temperature ranges from 2 5 ∘ C to 3 0 ∘ C . Determine its temperature range in degrees Fahrenheit, using the formula 𝐹 − 3 2 = 1 . 8 𝐶 , where 𝐹 is the temperature in degrees Fahrenheit, and 𝐶 is the temperature in degrees Celsius. The surface area, 𝐴 , of a cylinder in terms of its radius, 𝑟 , and height, ℎ , is given by 𝐴 = 2 𝜋 𝑟 + 2 𝜋 𝑟 ℎ 2 . Express the radius, 𝑟 , of a cylinder with a height of 4 feet as a function of 𝐴 . Find, to the nearest foot, the radius of such a cylinder whose surface area is 200 square feet.